Part of popular Brisbane bikeway closed for 12 months…?!?! Part of one of Brisbane’s most popular bikeways will be closed for 12 months from Monday. The Bicentennial Bikeway will be closed from the Goodwill Bridge to behind 1 William Street as part of an upgrade linked to the Queen’s Wharf development. The design plans for the new section of the bikeway previously sparked concerns from the Brisbane City Council and cycling groups but the state government has announced a feasibility study to work out the design. Queen’s Wharf Brisbane said that when the upgrade was done the 500-metre section of bikeway would be transformed to include a three-metre-wide separated bikeway with an improved line of sight, the removal of dangerous pinch points and an adjoining two-metre-wide pedestrian path. “In addition to this, a dedicated mangrove walk will be constructed on the river as a scenic walk for pedestrians,” Queen’s Wharf Brisbane’s bikeway fact sheet said. 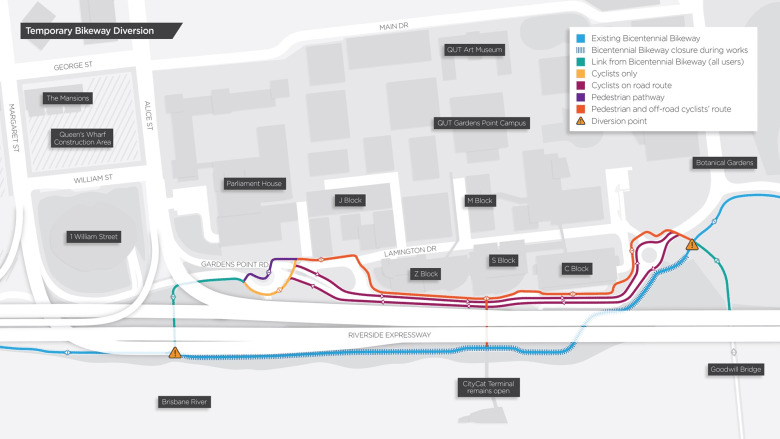 Users of the Bicentennial Bikeway will be diverted along Gardens Point Road to connect between the Goodwill Bridge and Bicentennial Bikeway near Margaret Street. The speed limit on the shared zone has been reduced to 20km/h. The QUT CityCat terminal will operate as usual. Star Entertainment Group managing director Queensland Geoff Hogg said safety during construction was the priority. improvements that we will be making along Gardens Point Road," he said. Bicycle Queensland chief executive Anne Savage said the group worked closely with Destination Brisbane Consortium and other cycling groups to seek feedback and incorporate suggestions into the final diversion design. “The diversion along Gardens Point Road is a safe, seamless solution for cyclists and pedestrians, which has been achieved through strong community consultation and engagement," she said. It was expected the diversions would be in place until mid-2019.